Shortly after it was announced at CES 2019, the first wave of ASUS ROG gaming laptops carrying NVIDIA’s latest GeForfce RTX engines has finally reached the Philippines shores. Among the first batch of these new gaming machines is the ROG Strix Scar II. Available in 15.6- and 17.3-inch, the ROG Strix Scar II comes with 144Hz refresh rate and 3ms response time. Both versions also boasts a shooter-inspired motif that uses splashes of camouflage accents. The highlighted WASD keys makes it easy to find the home row for FPS gaming. 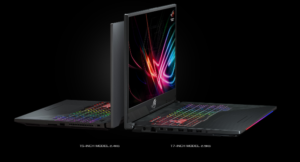 In addition, both versions of the Strix Scar II come with options of either an NVIDIA GeForce RTX 2060 with 6GB GDDR6 VRAM or an NVIDIA GeForce RTX 2070 with 8GB GDDR6 VRAM. All variants comes equipped with an Intel Core i7-8750H processor, 16GB DDR4 2666MHz RAM, and 256GB NVMe PCIe SSD + 1TB SSHD for storage. The ASUS ROG Strix Scar II with NVIDIA GeForce RTX 2060 and 2070 will become available starting January 29, 2019. Bundled with the Scar II laptop are: an ROG Bag, ROG Impact Mouse, and ROG Eye Sculpture. You can purchase the Scar II at ROG Districts and authorized retailers nationwide, including Lazada and Shopee.